On 29 May 15, twenty-four members from the Nokomis Regional High School JROTC and JMG programs climbed Bigelow Mountain (4150ft – 10 mile hike) in western Maine as part of the Summit Project. The Summit Project is a living memorial that pays tribute to the fallen service members from Maine who have died in the line of duty since September 11, 2001. The Summit Project inspires service, strengthens~communities and changes lives. It reinforces the values that all Mainers hold dear – we look after one another, we remember one another, we take care of one another, we are faithful to one another and we lift each other to higher places – both literally and figuratively. What a great effort to support and get our Nokomis Regional High School students involved in! The surviving families of our fallen Maine heroes made this project viable. Not only have they shared the stories of their loved ones’ character, integrity and service, they have also unearthed and donated a special memorial stone that uniquely represents their loved one. These stones are engraved with initials, rank and dates of the fallen service members – weighing between 5-15lbs. Our group carried 22 stones (approx. 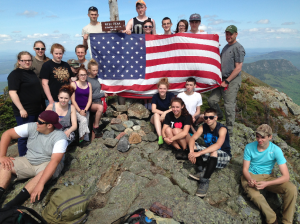 200lbs) for our fallen Maine heroes to the summit of Bigelow Mountain. We were blessed with ideal hiking conditions, clear skies, and tremendous views on the summit. 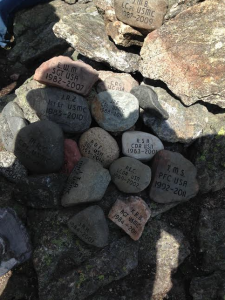 The students researched and discovered the lives of their heroes, planned the hike, carried the stones to the summit, held a ceremony on the peak honoring the fallen, and then posted their individual reflections on the Summit Project website. We look forward to making this an annual event! Let us not forget our fallen!